This is a vast improvement on the U.S cover released a couple of months ago. 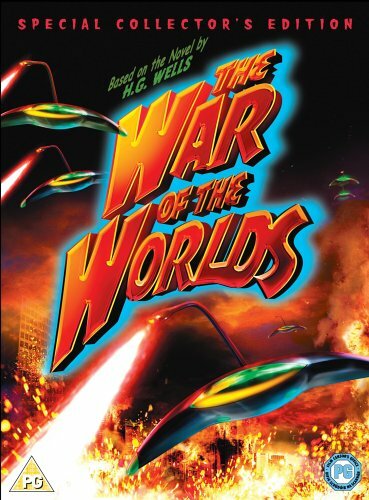 This is the cover to the 2 disc 'Collectors Edition' released here in the U.K of George Pals classic sci-fi adaptation The War Of The Worlds, released the same day as Spielbergs/Paramounts on November 14th. I'm a bit surprised it's a PG, I saw it as a kid and it didn't scare me. Looks good. Nice old cartoony sci-fi font. Very nice. Captures the 'pulp sci-fi' feel perfectly. New cover angle and contain info. My Dad oft tells me how he saw the movie on the flicks when he was about 15 ands it terrified him. I didn't scare me but I'd already seen, The Texas Chain Saw Massacre by then.